Mr Syed Aftab is a Consultant Spinal Orthopaedic Surgeon at the Royal London (Barts Health NHS Trust). He studied medicine at Pembroke College, Cambridge University and Edinburgh University. He underwent higher surgical training in Orthopaedics and Spinal Surgery on the London NE Thames rotation at the Royal National Orthopaedic Hospital, Stanmore. He also gained a Master of Science at University College London in Trauma and Orthopaedics during his training. Syed completed advanced fellowships in Spinal Surgery at the Royal London Hospital. Furthermore, he continues to broaden his experience with visitations to international centres of excellence for spinal surgery (Antwerp Belgium, Bordeaux France, Neustadt Germany and Orlando USA).Syed has been pioneering the iMAS technique in the UK, using micro access techniques developed by Dr Robert Masson at Neurospine Institute, Orlando, USA (a Federally accredited Centre of Excellence).Syed believes that the best outcomes for patients can only be achieved when decisions are carefully considered and works within the framework of a multidisciplinary team. He is the Clinical Effectiveness Lead for Orthopaedics at the Royal London and is actively involved in teaching other doctors, nurses and allied health professionals. 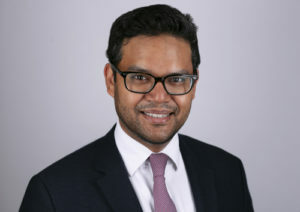 He organizes the ‘Spine Term’ for the Royal London Hospital and Sir Percival Pott Orthopaedic Rotations.Syed has published widely in a number of peer-reviewed medical journals and is actively involved in research into spinal surgery. He has presented at national and international conferences.